For security reasons, it is highly recommended that you do not leave "live" checks in your account after they are printed and processed. A record of every check transaction (minus the full account number) is maintained so you can always search and view the complete details about any check, even after the "live" check has been deleted. If desired, you may download a copy of each check so you have a permanent record. Once downloaded you can open the file in the Adobe reader to Print if desired. The instructions below are based on the use of the Internet Explorer browser, but other browsers will be similar. 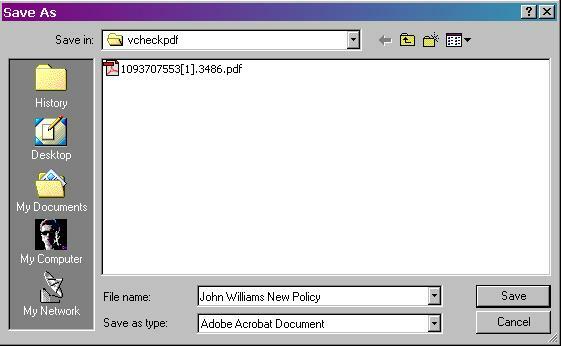 As an additional security warning, it should be noted that downloading copies of the actual check PDF files should only be done in a secure working environment where there is little chance of unauthorized access to that particular computer - as the PDF files can be printed multiple times and also contain the complete checking account information. 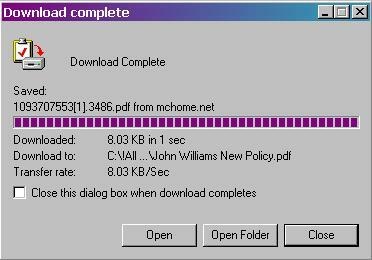 When the download completes (will only take a second or two) - you may receive the Download Complete dialog box if you don't have the option to automatically close that box selected. If you click on the Open button - it will launch the downloaded file into Adobe. 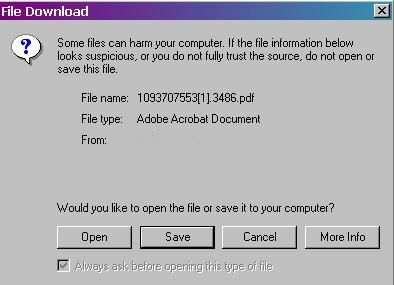 If this dialog box automatically close after the download, you can always launch Adobe Reader, navigate to the file via the File - Open command and launch the file. Security Warning: it should be noted that downloading copies of the actual check PDF files should only be done in a secure working environment where there is little chance of unauthorized access to that particular computer - as the PDF files can be printed multiple times and also contain the complete checking account information.